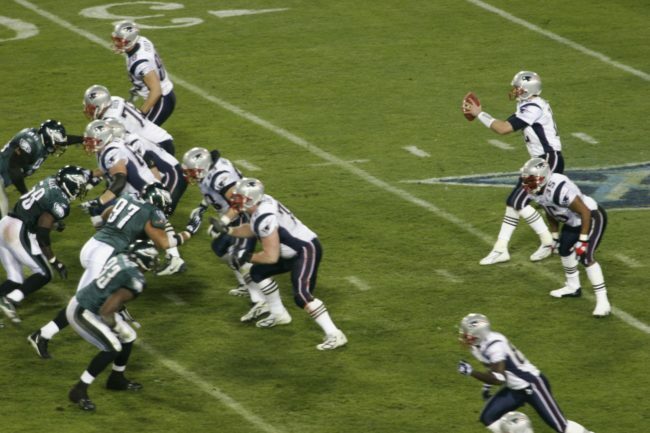 Tom Brady takes the snap during Super Bowl XXXIX. Brady threw for 219 yards to give the Patriots their third Super Bowl victory in four years. At 41 years old, New England Patriots quarterback and future Hall of Famer Tom Brady is on the verge of winning his sixth Super Bowl, which will give him the most championships as a single player in NFL history. It also makes him the oldest quarterback ever to start in a Super Bowl – a record he set last year. After being selected with the 199th pick in the sixth round of the 2000 NFL Draft by the New England Patriots, Brady’s tenure with New England has been nothing short of greatness. He’s broken every passing record in the franchise’s history and is the NFL’s all time winningest quarterback. Brady could add one more Super Bowl win to his extensive resume in Sunday’s game against the Los Angeles Rams, even though some people believe his age will be a factor in the game. According to the NFL Players Labor Association, the average NFL career lasts just 3.3 years. Brady is in his 18th season and his numbers haven’t declined since he’s turned 33, which is usually when quarterbacks begin to decline. Sunday’s Super Bowl will have the widest margin of age difference between starting quarterbacks in NFL history. There’s a 17-year difference between the two – Rams quarterback Jared Goff was seven years old when Brady won his first championship in 2001. Brady’s ninth Super Bowl appearance marks the most all time by a single player in a career. NFL legends such as Dan Marino, Michael Vick and Philip Rivers have zero appearances and they are all future Hall of Famers. But Rams defensive back Nickell Brody-Coleman believes Brady’s age will catch up to him during the Super Bowl. This is the second time in Brady’s career that he’ll be facing the Rams in a championship setting. The first time in 2001, the Rams had the NFL’s third ranked defense and held opponents to just under 85 rushing yards per game. These Los Angeles Rams aren’t as dominant on defense, even though they are led by the NFL’s sack leader Aaron Donald who has 21.5 on the year. There is some concern for Patriots fans about Brady’s age in this year’s game, mostly centering around Brady being hit by the Rams’ aggressive pass rush. 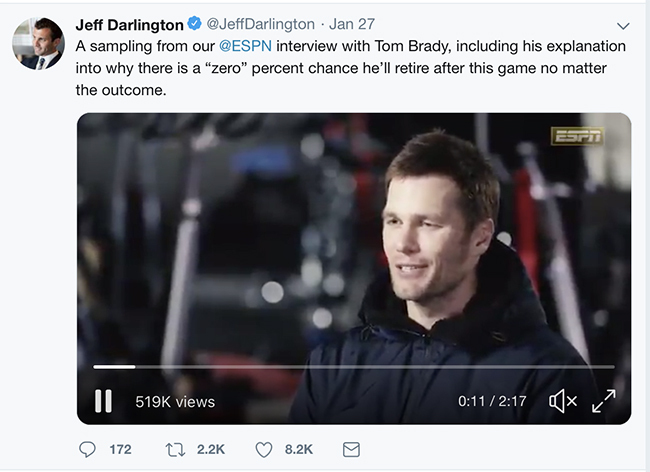 In an ESPN interview with Jeff Darlington, Brady confirmed he’ll be back.